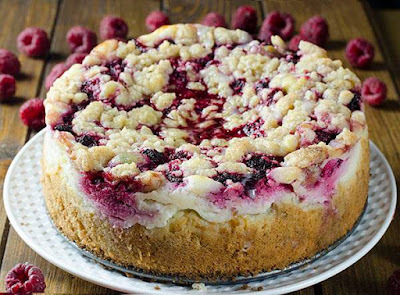 Raspberry Cream Cheese Coffee Cake – all flavors you love, you’ll get here in every bite: moist and buttery cake, creamy cheesecake filling, juicy raspberries and crunchy streusel topping. Raspberry Cream Cheese Coffee Cake – all flavors you love, you’ll get here in every bite. To make the filling: Mix together the cream cheese and sugar on medium-low speed until creamy. Add eeg white end mix on low just to combine. Set aside. To make the cake batter: In a bow stir together flour, baking powder, baking soda and salt, set aside. With an electric mixer cream together the butter and sugar on medium-low speed. Add egg and egg yolk and vanilla. Slowly mix in the flour mixture alternating with the sour cream. Transfer the batter into the prepared pan and smooth with a spatula. Spread the cream cheese filling on top. Place raspberries onto cream cheese filling. Sprinkle the streusel on top of raspberries.